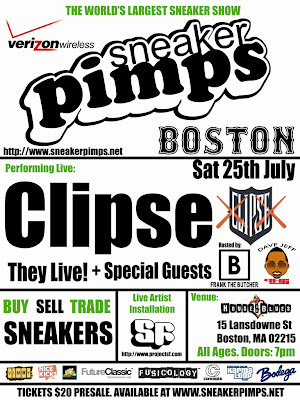 This year Sneaker Pimps landed at Boston @ The House of Blues, and I traveled four hours just to see if it was any different than Sneaker Pimps in NYC. My gamble payed off - a lot of sneakers that were on display were different, with the exception of a few like these pair of black Tokidoki's. But who's complaining, its a sneaker art show! As I stepped in I caught a glimpse of a what looked like a stages box. It turned out to have the Livestrong x Futura Flom's inside, and of course I had to take a shot of that. "It took four days of hard work for me to get this" she said, "But it was damm well worth it." The set up was pretty much the same as NYC but smaller - the main floor had the majority of the display kicks, with upper floors serving drinks and trades/vendors as well up there. Somewhere between walking around and scoping out the place my eyes landed on this custom sneak by SKULL-FUCKERS art hermit Miquel Matos. There's no denying it - the amount of detail put into that one sneaker was mindblowing. Grey upper with a grey/white toned midsole simply covered in art with a pink theme destroyed all the competition. A sneak from Destroy Rockcity was also there - its an all white Converse sneaker with a fish designed to look like it was swimming against the current, which takes up the whole sneaker. For you graff heads out there - a pretty sick wildstyle piece was present on a white Nike Air - I think the picture speaks for itself. As with any Sneaker Pimps events - there was the art. There were three main pieces already painted by the time i exited the building, my favorite being this one (below) of a woman in a meditation stance with sneakers attached to her hands. I snapped a couple pics of people trading upstairs, and the two girls at the custom vendor entitled "Fresh Squeeze" before I left - Thanks Guys! The whole album slideshow is right underneath - its about a total of 70 pics give or take. Enjoy! looks great, ANIVRAM'S blogger is on point!! Iight so u kno big sis wants a pair of Tokidoki's cuz she looooves Tokidoki!!! I'ma come with u next time cuz I need a pair of some flyy flyy kix n now I kno u kno where to find em!! Luv ya!! Keep up the good work!! !